This December's Rogue One: A Star Wars Story will introduce several new faces to the franchise, but fans have already met some of the characters in the movie. 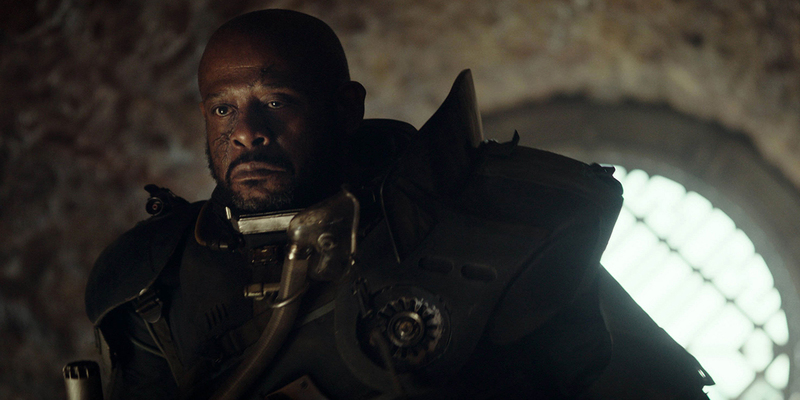 Darth Vader is the most obvious one, but Star Wars die-hards are probably familiar with Saw Gerrera, played by Forest Whitaker. Saw first appeared in the animated Clone Wars series and is now making the jump to the big screen. He has only been briefly featured in the marketing materials, but his inclusion is an exciting proposition for those who follow all content in the new series canon. Since Gerrera has not been a primary focus in the trailers, some viewers may be wondering how he fits into the main narrative. From the looks of it, he is a grizzled warrior who provides some words of wisdom to Jyn Erso and her team - perhaps filling a similar role to that of Maz Kanata in Star Wars: The Force Awakens. For those curious, the newly released novel Star Wars: Catalyst from author James Luceno may have some answers. Gerrera has a minor presence in the book, but he ends up aligning with the Ersos at a critical time. In Catalyst, readers meet a smuggler named Has Omitt, who performs jobs for Orson Krennic. Following the conclusion of the Clone Wars, Has helps one of Krennic's former assistants (claiming to no longer be involved) move old Separatist arms, such as battle droids and ion cannons, to various planets. After he completes his first run, Has is surprised to learn that he's actually been taking part in a subterfuge operation; once Obitt drops off his payload, the Empire arrives and seizes the planet's mining operations to get material for the Death Star project. What's most startling is that this is taking place on Legacy worlds, which are locations exempt for exploitation. Has eventually has a change of heart and decides to fight back against the Empire. One of the people he brings in is Saw Gerrera. The main narrative of the book involves Krennic recruiting his old school friend Galen Erso to Project Celestial Power, a code name for the Death Star construction. Krennic tells the pacifist Erso his research will be used to create renewable energy for the galaxy, but it instead is being used to develop a weapon for the space station. Learning the horrible truth and that he was deceived, Galen decides to flee with his wife Lyra and young daughter Jyn. Their pilot off Coruscant - set up through contact with Has - is none other than Gerrera, who brings the Ersos to the remote world Lah'mu. Saw cannot stay to live with the family, but he promises to visit them whenever he can. Jyn instantly views Saw as a friend, forming a relationship that obviously continued into her adult years. While this doesn't reveal how Saw gets involved with the cause in Rogue One, readers do learn some context. Jyn has known Gerrera since she was a child, which could explain why she seeks him out while embarking on her mission to steal the Death Star plans. Saw has been battling against the Imperials for a long time and probably possesses some knowledge that could prove to be valuable. Also, since Jyn is trying to find Galen, she's probably hoping that a family acquaintance knows where he is. It's an interesting wrinkle that gives director Gareth Edwards a fascinating angle to explore. Friends and family have long been common themes in the Star Wars films, and two Rogue One characters already have a strong connection.